Set iTunes. 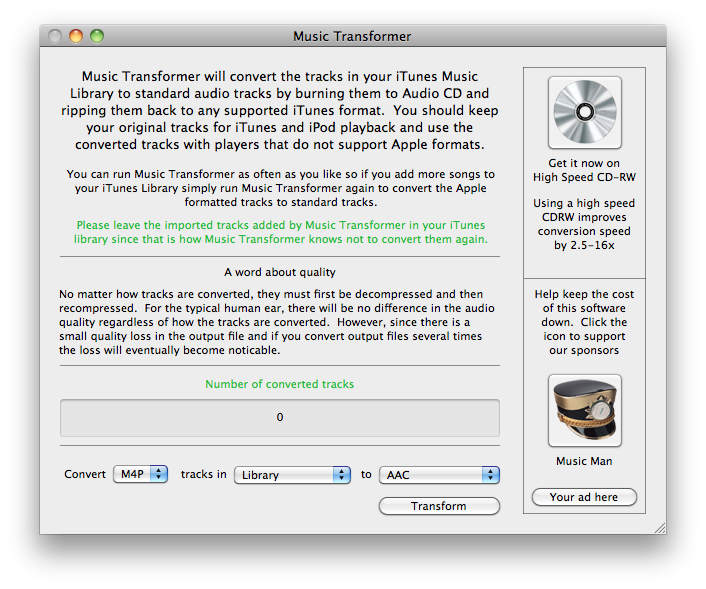 Music Transformer uses your current iTunes import setting to import your music, so you’ll need to set it to the format that you want to convert to: [MP3, AAC, Apple Lossless, AIFF, WAV]. Example: If you want to convert to MP3, choose MP3 as your import setting. – Select the play list containing the m4ps that you want to convert. If you have any difficulties, read the Read Me First document in the download. If that doesn’t solve the problem, read the FAQ or Contact Us. Should you use a rewriteable CD-RW or Virtual CD Drive software? CD-RWs are available from most Office Supply stores (Staples, Office Depot, etc.) and a inexpensive. You can re-use the same CD-RW multiple times. Using Virtual CD software instead of an actual CD Drive and a CD-RW will be faster, about 10x faster. If you’re converting a lot of iTunes m4ps, using a CD-RW will take a lot longer! Whether your Mac has a CD drive or not, you can use Virtual CD software and save a lot of time. This is actually why we wrote Virtual CD-RW – to speed up converting iTunes m4p to mp3. If you want to save time and money, buy it bundled with Music Transformer and save $10!